Welcome to the Four Queens Las Vegas Casino Resort review. The facility is located off the Strip. In fact, it is best to say that the facility is in Las Vegas downtown. It is among the Las Vegas hotels that are notable, often frequented by travelers. It is hard to hard to find parking space on weekends and during special occasions. Does that mean that you shouldn’t visit this facility? If you say so, it means those who visit are silly. They do not know what they are looking for. The opposite is, however, that this facility is ideal for you. 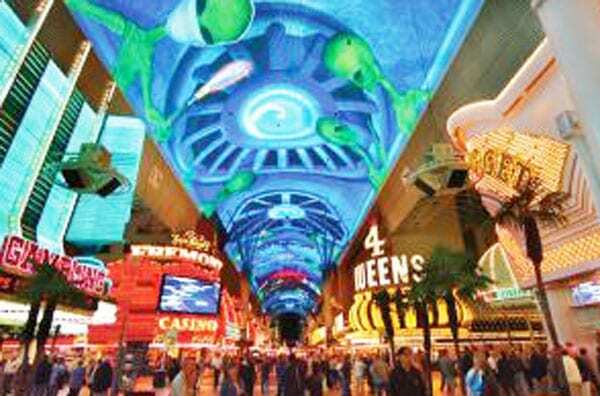 This casino opens a wide entrance to the Fremont Street experience. Four Queens has been in business since 1966. This makes the resort one of the oldest in Fremont. A closer look at the Four Queens will tell you that most families do not carry their kids here. Whether it is their liking or it is because there are no kids, the fact is not many families come with kids. Instead, you are likely to see a couple that has retired. If they are not, they are about to. In essence, the point is that most of the folks who visit the facility are people whose needs are simple. They don’t want complications. It is either they are here for a drink, or they want to catch some sleep. One thing is for sure about this gaming and hospitality resort. While it is true that is an old hotel; nothing has been done to change this. A section of hotels in the area has spent some time to do thorough renovations. They have done this with the aim of remodeling their businesses. Of course, it is to make them look modern. Unfortunately, nothing like that seems to cross in the mind of the operator. Instead, it is easy to tell that this is a classical facility. Perhaps, it is an ingenious way the operator is using to attract retirees. If so, it is working because the floor is usually full of the old rather than the young. The casino occupies 32, 000 square feet. Above all, this is a small space, but you can still enjoy a variety of games from here. The Rooms in this hotel are relatively small. Inside the rooms, you will not get fancy decorations and amenities. But the good thing is that you will find enough space and amenities for a night. Speaking of rooms being reasonably small, we are talking something like 250 square feet.